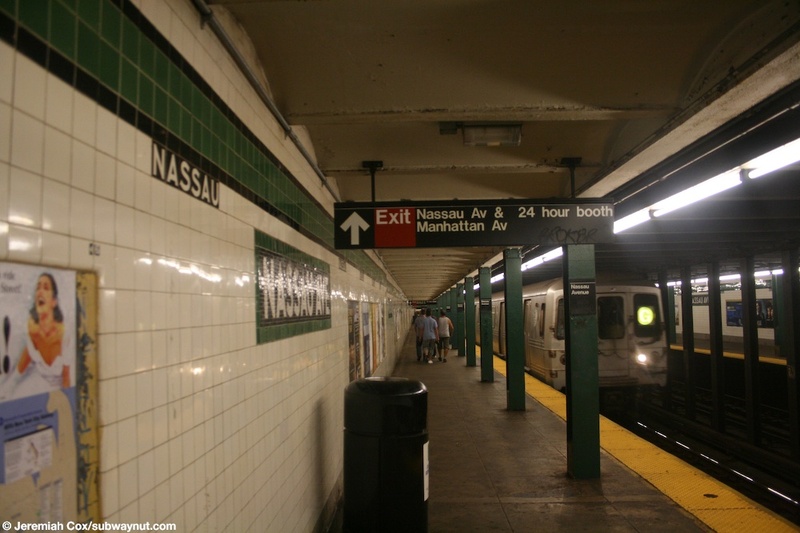 Nassau Avenue has the standard two side platform design for a Crosstown Line station with the green trimline (and black boarder) with Nassau written directly beneath the boarder, no tile long gap. The name tablets are white text on black also with a green boarder. 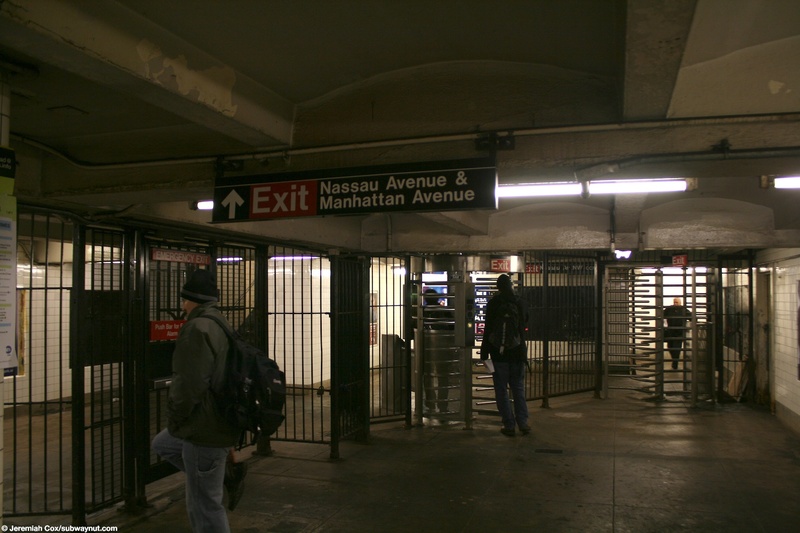 For exits the station has two, at the northern end of the station are single High Entrance/Exit Turnstiles (No MVMs) along each platform each with a street stair entrance on the Northern corners of Norman Avenue's intersection with Manhattan Avenue. 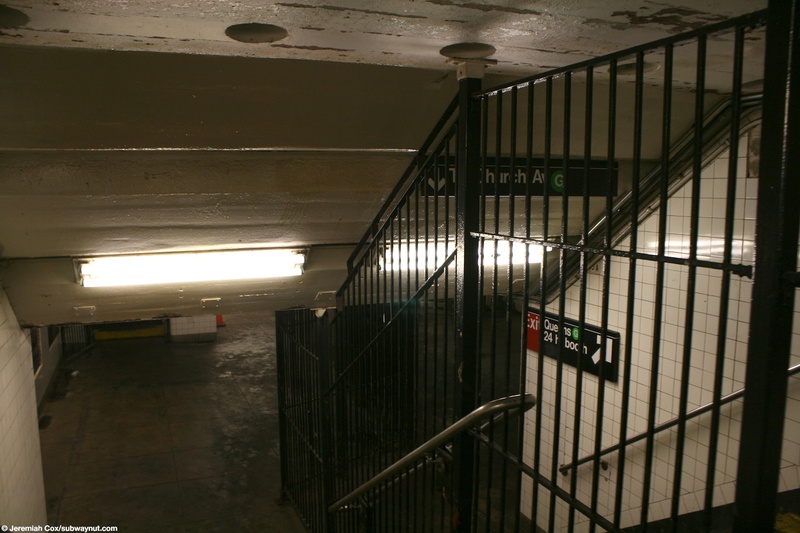 The full time entrance is at the southern end of the station and each platform has a single short staircase up to an unusual mezzanine. 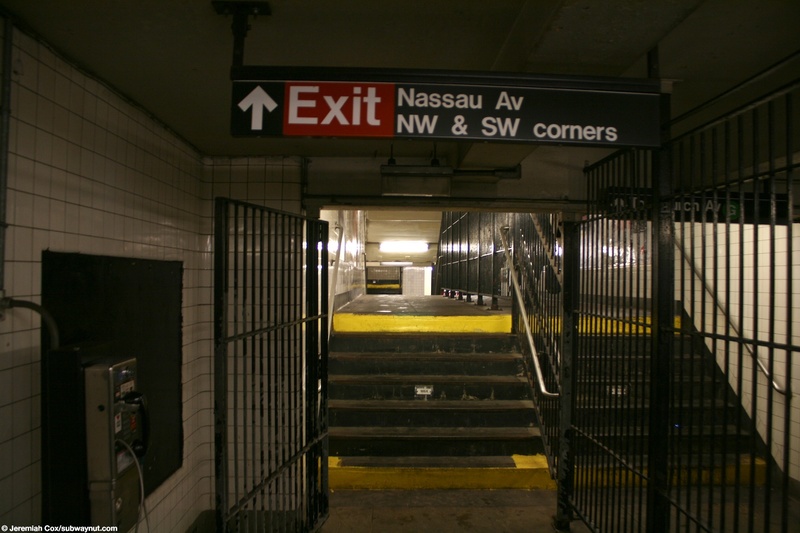 From the Church Avenue-bound platform passengers immediately reach two High Turnstiles for staircases on the NW and SW corners of Manhattan Avenue and Nassau Avenue or can continue, now in the direction of the tracks up another short staircase to an overpass level (with a fence in the middle making half of it in fare control and the other half outside of it) and back down another short flight of stairs to a bank of turnstiles and the station's only token booth. 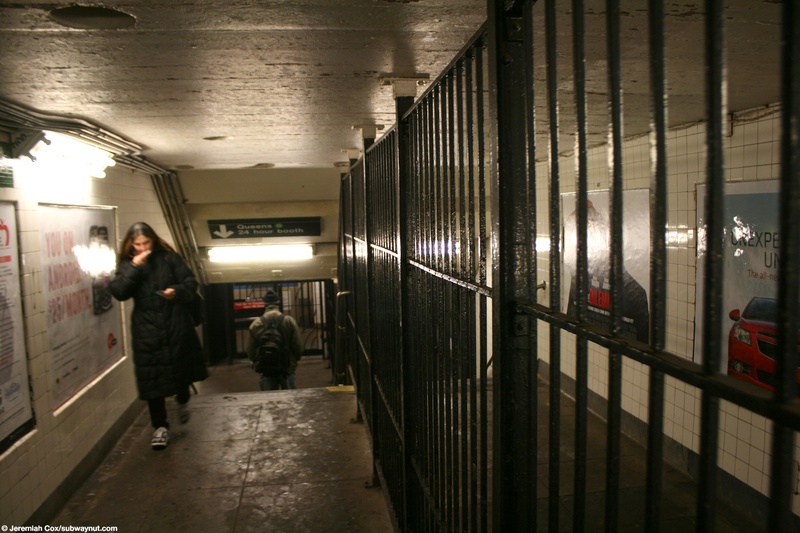 Here is the staircase down to the southern end of the Long Island City-bound platform forming the free cross-over. From here are staircases to the NE and SE comers. 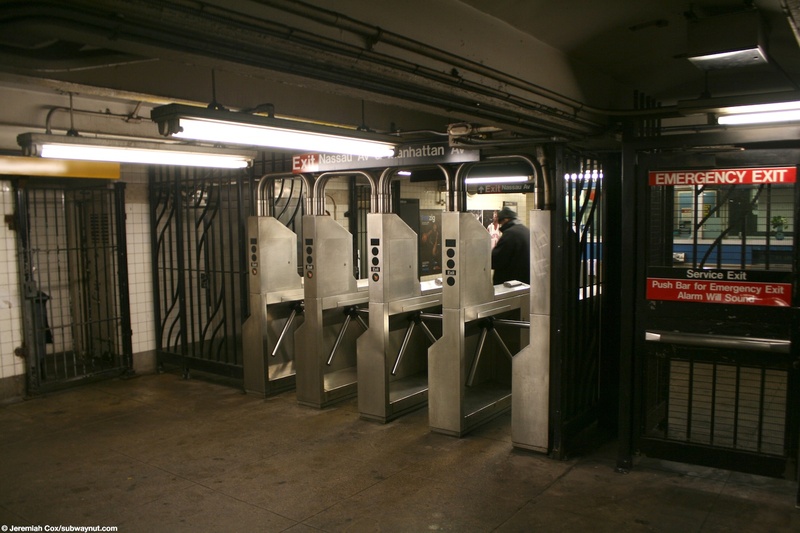 The four street stairs here are entirely connected outside of fare control by the same overpass as well with a fence in the middle to separate the fare control area. 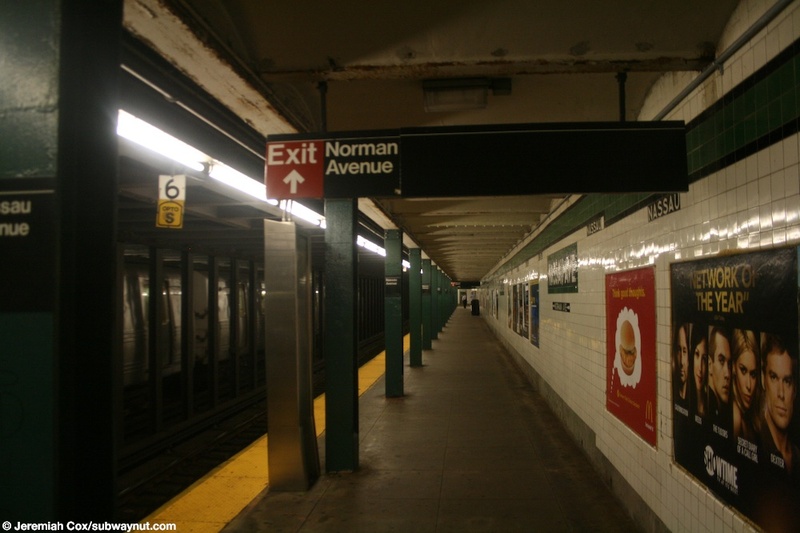 G trains four car trains stop at Nassau Avenue a the southern end of the station requiring riders at the Norman Street end to due the G-train dash for four car lengths to reach their train. 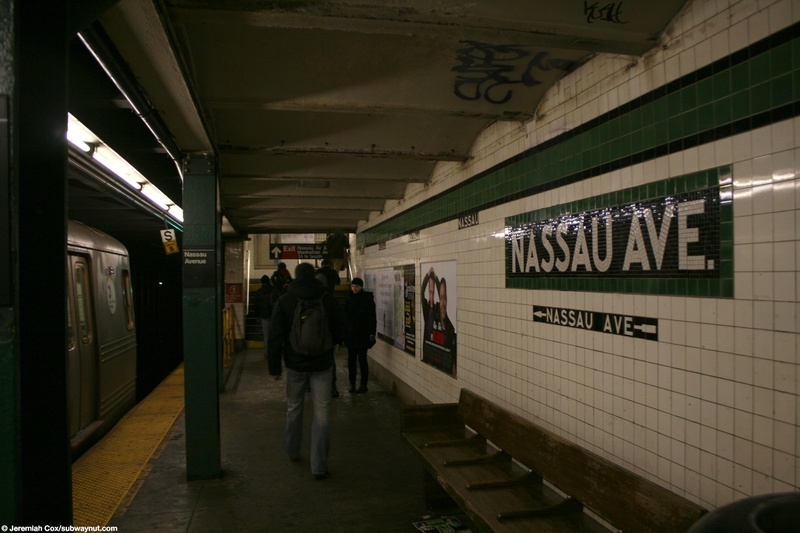 (nassaug1) Looking down the platform at Nassau Avenue as a G train begins to leave the station. 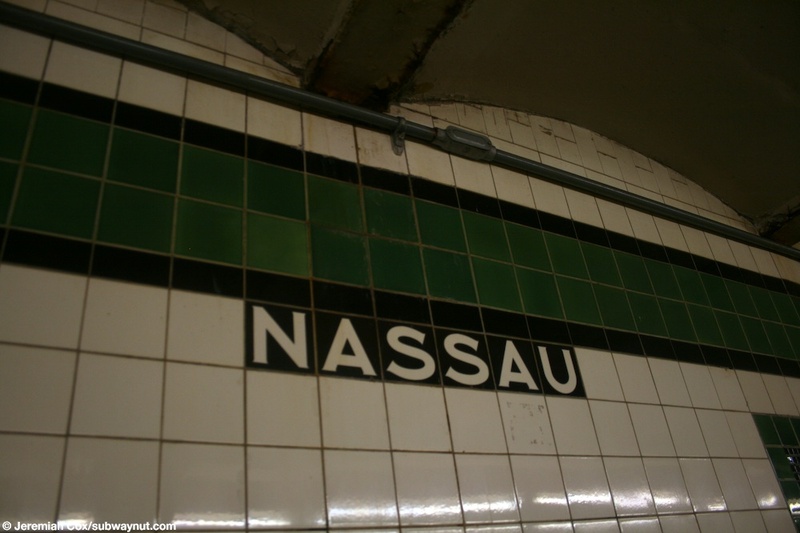 17 August, 2008 (nassaug2) Nassau is written just below the green line of trim. 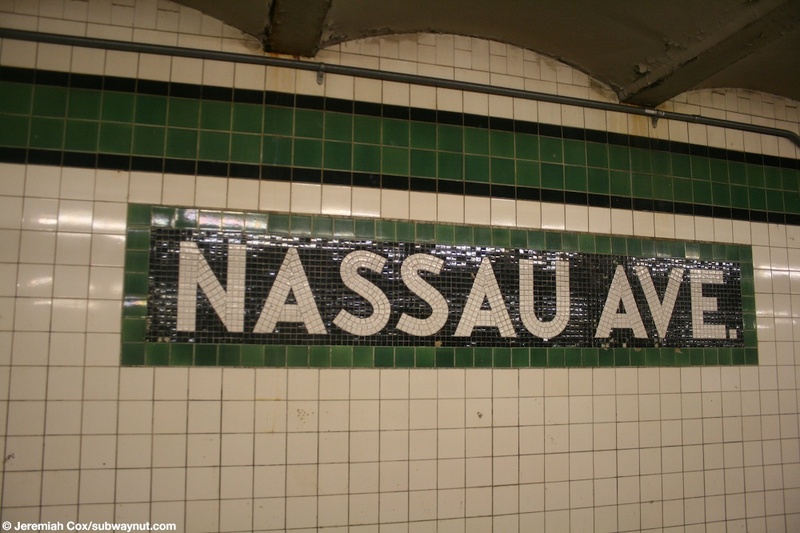 17 August, 2008 (nassaug3) A name tablet at Nassau Av. 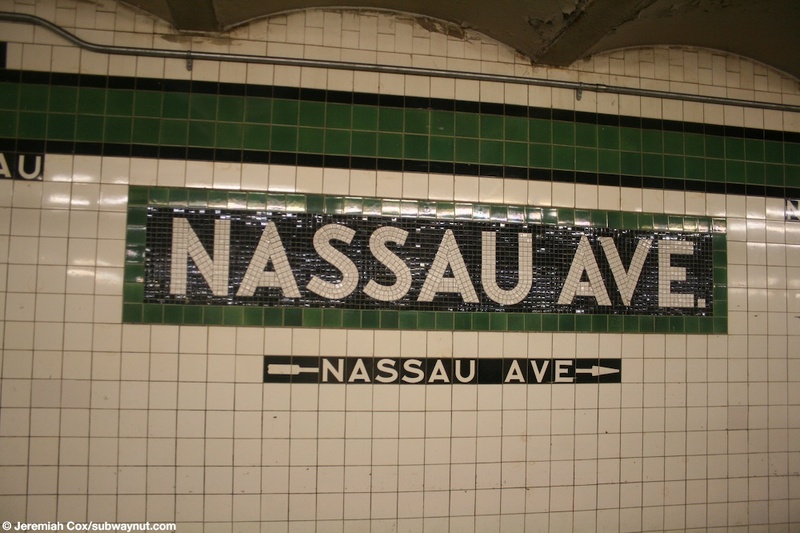 17 August, 2008 (nassaug4) Another name tablet at Nassau Av this one has the arrow pointing to the exit at Nassau Ave underneath it. 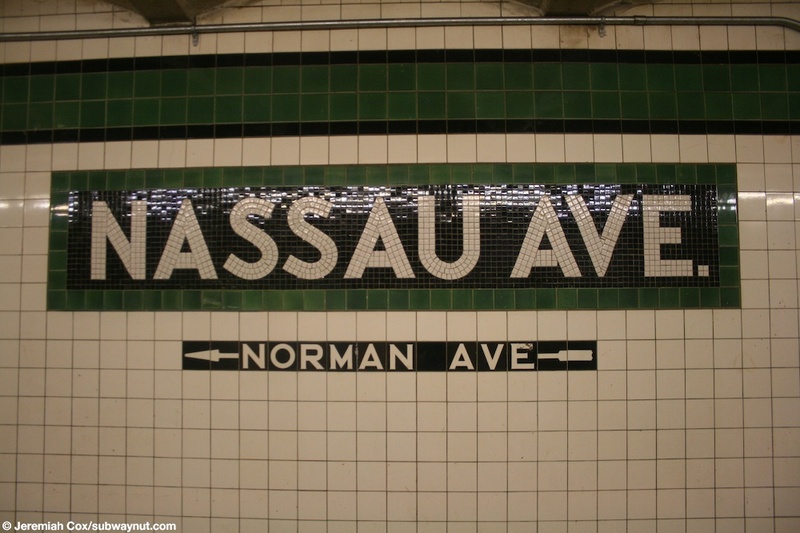 (nassaug5) Looking from the 6 car mark at Nassau Ave towards a sign for the exit to Norman Avenue. 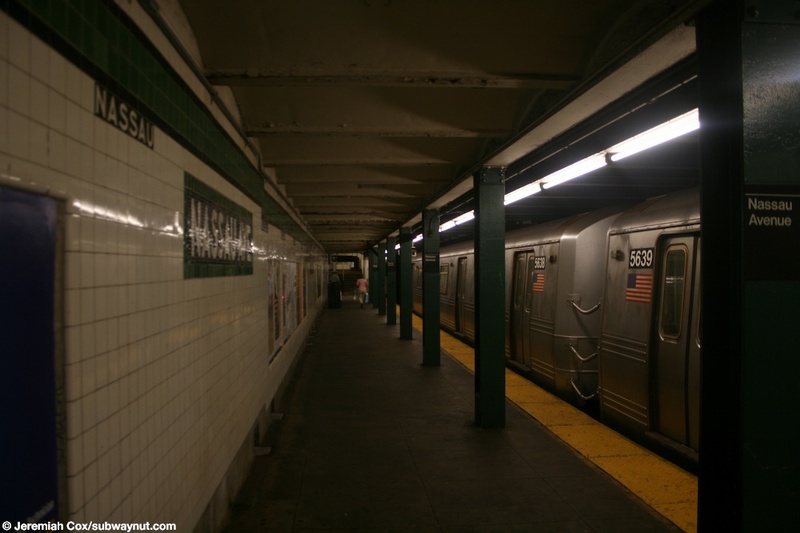 This is the front of most G trains, passengers have to walk all the way down the platform to leave the subway system. 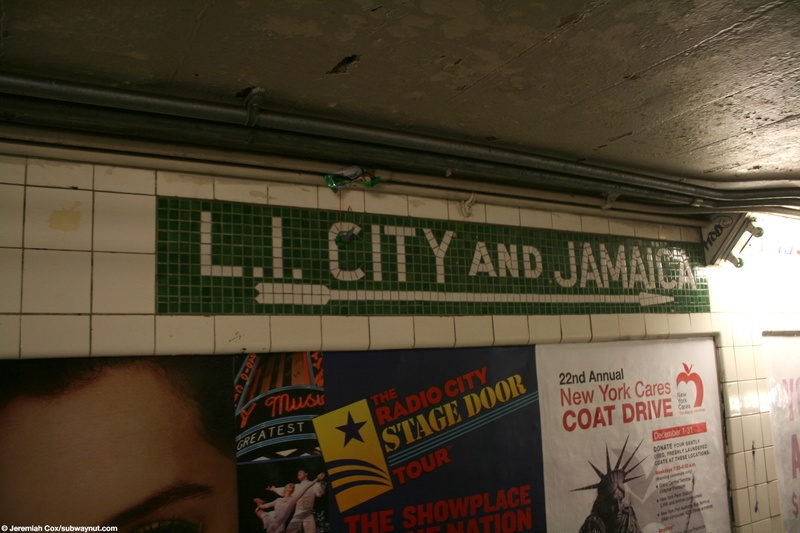 17 August, 2008 (nassaug6) A name tablet at Nassau Av with the text to the exit to Norman Ave underneath it. 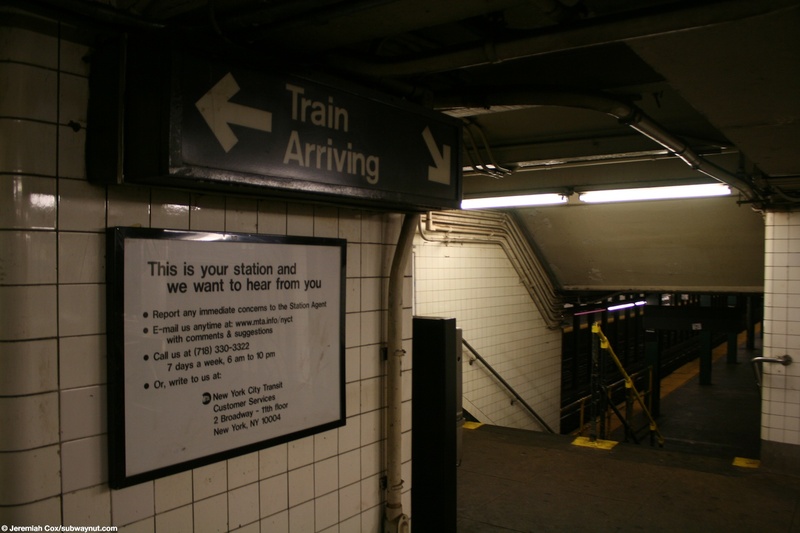 17 August, 2008 (nassaug7) Looking down the Queens-bound track at Nassau Av, as a R46 Queens-bound G trian enters the station and a sign for the 24 hour booth at Nassau Av & Manhattan Av. 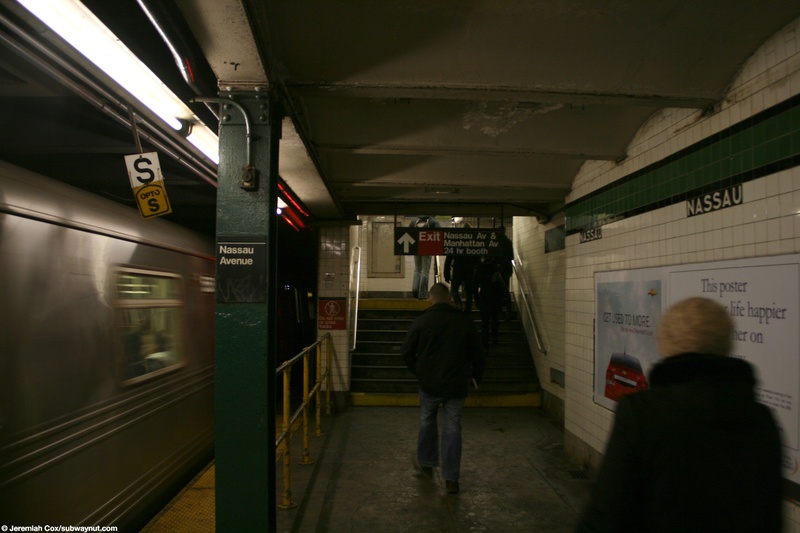 30 December, 2010 (nassaug10) The main exits from the Church Avenue-bound platform in the small mezzanine are two High Turnstiles. 30 December, 2010 (nassaug14) An unused train arriving sign for the Special Waiting area . 30 December, 2010 (nassaug15) Looking up the second short staircase that leads to the overpass over the tracks after leaving fare control, a gate can close off this portion of the station outside of fare control.